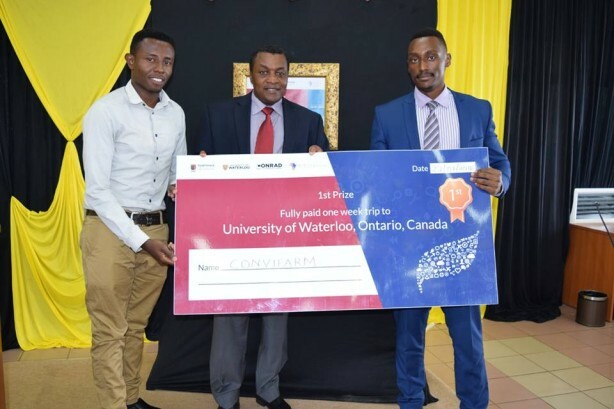 Two Kenyan students who developed agribusiness mobile App ConviFarm are the winners of the top prize for the @iLabAfrica- Waterloo University Agribusiness mobile Tech challenge. Norman Muga of Strathmore University and Mburu Njunge of Kenyatta University were handed their their air tickets and invitations to stay at the University of Waterloo last week by @iLabAfrica at an event graced by Kenya’s Ministry of Information and Communication Principal Secretary Dr. Victor Kyalo. The fast growing @iLabAfrica centre is Strathmore University’s technology research and innovations centre. The centre partnered with the University of Waterloo of Canada in the agricultural mobile applications competition seeking to generate applications with high impact potential to Africa’s agribusiness sector. “Agriculture is the mainstay of at least 80% of the Kenyan population. We chose this sector because it has a direct impact on the bottom of the pyramid masses,” said @iLabAfrica Director- Dr. Joseph Sevilla. The Agribusiness Mobile tech challenge is open to members of the public, students of Strathmore and other universities as well as private applications developers. It has its top Prize being a two week trip to Ontario Canada, where winners join other developers around the world in training and incubation. The second prize is a full scholarship for a 6 months Strathmore Entrepreneurship Development Program. Speaking during the award ceremony, Dr Victor Kyalo commended @iLabAfrica for delivering global partnerships that deepen technology adoption and local innovation. “This centre continues to develop programs that interest developers come up with world class mobile technology solutions targeted at the bottom of the pyramid in Africa,” he said. The challenge is employing a virtual incubation technology developed by the Conrad Business, Entrepreneurship and Technology Centre at the University of Waterloo, as a way to reach, nurture and incubate agribusiness mobile app ideas across Kenya. @iLabAfrica has been running the system on pilot at its @iBizAfrica incubation centre.